The Medical Elevated Toilet Seat or Commode Seat Riser is designed specifically for individuals with sitting or bending difficulties due to an aging ailment, medical ops or sports injury. Its unique ergonomic design adds 5" of height to your regular toilet seat, making it easy to sit or get up from. Its smooth, seamless, contoured seat is designed with a wider surface for added comfort and stability. 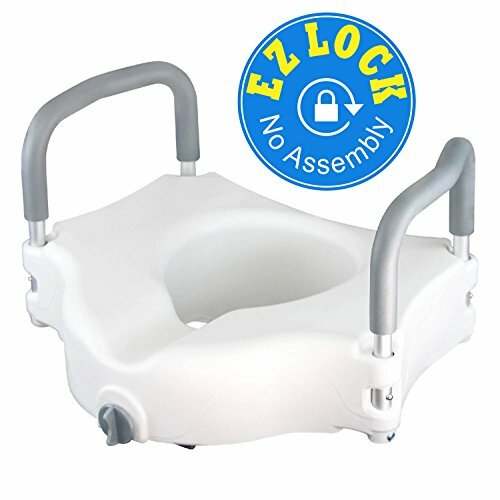 It includes a front recess for easy reach-in and an anti-slip feature and locking mechanism that secures the seat firmly in place. Its comfortable padded handles are versatile and can be removed easily without tools making transfer easy. Made of high quality, anti-bacterial heavy-duty molded plastic construction, the Medical Elevated Toilet Seat will endure frequent, long-lasting use. LIGHTWEIGHT & PORTABLE. Weighs less than 5lbs. Easy to store or travel with. Works best for individuals below 250lbs and height below 5ft 10. EASY INSTALLATION AND CLEANING. Tool-free installation and universal fit on most toilets. Fits most standard toilets (16.5") and elongated toilets (18.5"). Simply wipe clean. Do NOT install the product on the toilet lid. It should be installed on top of the toilet seat. Please note that the product is designed for only certain models of toilet seats. If the product is not stable after assembly, please do not use the product. Your toilet seat is probably not suitable for this product.